Be honest. How many people reading this have attended or even taught a training course where you have used 2’X4” pieces of lumber to outline a room? How many of you have used this wood-outlined configuration for dynamic or static entry training? What about searching rooms outlined by strips of wood? These concepts are good at building on classroom instruction and enhancing the fundamentals necessary for entry and clearing. But is it great? Realistic? Don’t worry, we both know the answers. It is time to demand more out of training. The list of “props” that have been used by law enforcement and the military in training to add realism would take too much time to list. The days of telling an academy recruit, “Now simulate these pieces of wood are a room and this is the door,” are over. The technology of today allows us to have better training materials. Current technology allows us to have more realism added to our training scenarios. It allows us to train in controlled settings that are as real as possible without actually being in a free-standing structure, which has been vacated for your coursework. 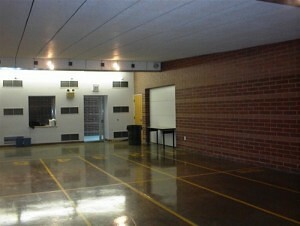 There is nothing wrong with conducting your training in a real building. Personally, in the past I have run my recruits to several locations in various cities for them to get the most realistic training possible. If your organization is lucky enough to have established relationships with businesses, warehouses, apartment buildings and private homes, then you know just how challenging having a training course in those locations can be. It takes a significant amount of time and effort to set training dates, coordinate with all parties involved, ensure your class know the location, have enough parking space, obtain approval from the neighbors and/or city if necessary. Wouldn’t it be much easier to have training that encompasses all of those types listed in a single structure? Of course! It would be great to have that type of capability in a single location. Is it possible and is it cost effective? Those are the key questions. And, by the way, the answer is yes, it is! The days of training our first responders, SWAT, corrections and military personnel with the most realistic and safe training using only one building are here! The answer can be found with Action Target and our newest product, FlexTact®. Action Target has recently partnered with Hufcor to be the Exclusive World Wide vendor for their FlexTact® movable wall training system. The FlexTact® system is currently used for non-live fire training only. Since non-live fire training can really be conducted anywhere, what is so great about this system? It’s simple. The system can be completely be reconfigured within minutes. For example, in a matter of a few minutes, you can transform your office scenario to a warehouse then into a residential setting. If you need to serve a high risk warrant and want to realistically structure your breach training, the physical layout of the residence can be duplicated with the FlexTact system. Since FlexTact® is only available from Action Target, we have been receiving requests from all areas of the world on how to incorporate this revolutionary training system into a new building or existing structure. The great aspect of FlexTact® is that it can be placed in either! Those interested in FlexTact® are from the commercial, military and law enforcement communities. The FlexTact® system compliments our core expertise in live fire ranges and shoot houses such as the M.A.T.C.H. 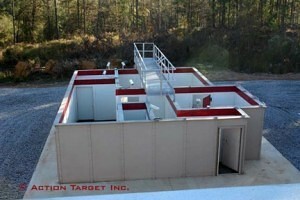 (Modular Armored Tactical Combat House) live fire structure shown below. Specially designed passdoors for entry exercises. Optional window inserts and glass walls panels for diversified training scenarios. Please notice from the picture that everything is suspended from above. There are no grooves in the floor, which means there are no tripping hazards. The FlexTact® system has an overhead railing system built on a grid pattern that can be self-sustaining or tied into the existing beams of a building. The panels can be moved quickly and set onto the floor with rubber feet that keep them in place. 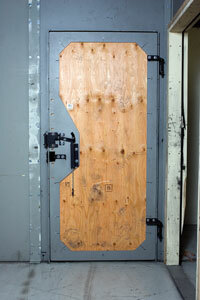 These panels accommodate full impact breach doors for entry training. They have frangible window options that can be struck with shotgun less than lethal rounds, training with explosives like Stingball Grenades or Flash Bang technology. This system has already been installed and used in many locations. It has been used by more than just law enforcement and military. This technology allows for firefighter training by filling the structure with smoke and having to search. Fire Departments from local, state and federal agencies are discovering the multiple uses for FlexTact®. They are also finding it is easier to obtain funding for a training structure that can be used for multiple purposes. Imagine having a 40’x40′ room, like a typical gymnasium. It is a big box with a wooden floor. How many of you have a room like this somewhere? I would bet that most of you have something similar that is the property of your agency. What is that space being used for? Storage? Offices? Mat room for Arrest Techniques / Defensive Tactics? Classroom? Now imaging having all of those capabilities in just one room! 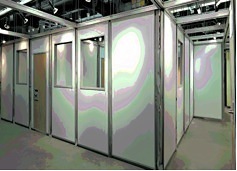 With FlexTact®, you can quickly reconfigure that room into anything that supports your training needs. This is the most revolutionary new product for public safety training! The capabilities are so substantial, that it warrants a further look. Action Target welcomes you to review it for yourself. Here is the FlexTact® Brochure for you to review. Take a look and you will see that FlexTact® will meet your training needs and can be placed in almost any existing building or incorporated into new builds. If you have a project currently underway and want FlexTact® installed, our lead time is as little as (5) five weeks from design approval to installation! You will not find a better option for a realistic structure that can be used for such diverse applications. As the industry leader, Action Target asks you to contact us today to learn how we and the FlexTact® system can support your training needs. Enhance your training realism today with FlexTact® by contacting Action Target! To learn more about Action Target and its full line of products, please visit www.actiontarget.com. For additional information on Tactical Breaching Door technology, please contact one of our Action Target Representatives, Law Enforcement & Commercial, Federal, Military or International. Who out there has actually breached a door? Most of our readers have breached many doors in the past. Most will have the opportunity to do it in the future as well. But, how many have actually trained over and over again within the same day? The truth is, not that many. 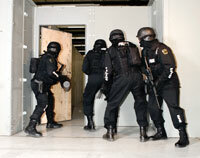 Action Target has developed a revolutionary Tactical Breaching Door™ that affords instructional staff the best option for consistent and realistic training. Our Breach Door adds a whole new dimension to training realism and eliminates the problems faced when training breaching techniques to students. The Tactical Breach Door uses advanced engineering which allows trainers to adjust the tension holding the door closed (shown below) and gives them complete control over the level of force required for a dynamic entry. The Tactical Breach Door is designed especially for use in Action Target’s Modular Armored Tactical Combat House (MATCH) shoothouse but it can also be used in a stand-alone frame or can be modified to fit into any existing shoothouse. There is no better option available. Shotgun, ram or explosive entries can be exercised and the patented latch system allows an immediate re-set for multiple training sessions. No more replacing doors after each entry-simply close the door and reset the latch. 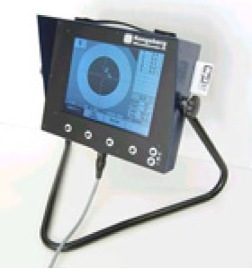 This allows for instant correction of improper technique, multiple repetitions in shorter training sessions and a range of difficulty levels for various entries. Take a look and you will see that our Tactical Breach Door will meet your training needs and can be used by itself with our free-standing option or integrate it into your MATCH or FlexTact® shoothouse. You will not find a better option for forced entry training. As the industry leader, Action Target asks you to contact us today to learn how we and our Tactical Breaching Door can support your training needs. Enhance your forced entry training today with our technology. Contact Action Target today! To learn more about Action Target and its full line of products, including the Tactical Breaching Door™, please visit www.actiontarget.com. For additional information on Tactical Breaching Door technology, please contact one of our Action Target Representatives. There is no shortage of techniques for clearing a stoppage or malfunction; just trying to explain the difference between the two sets off a never ending debate. Unfortunately, those who have time to engage in never ending debates lose track of what is important. You’re fighting for your life. Whatever works is what is important. Stoppages usually occur in the cycle of operation of the semiautomatic pistol or rifle, usually caused by a dirty, un-lubricated weapon, bad magazines (covered in a previous article) under powered ammunition, poor grip (including unlocking the wrist while shooting). There are other contributing factors, but these are the primary ones. A malfunction relates to a mechanically broken weapon that usually cannot be fixed on short notice. I would like to deal with the stoppage techniques in this article. First, prevention or at least steps we can take to prevent this from happening are important, but please keep in mind there are no guarantees. 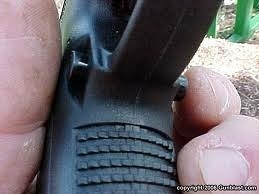 It is hard to believe that in 2010 the primary cause of stoppages is still dirty, un-lubricated firearms. With all the training and preaching about the importance of cleaning and maintaining our weapons systems many of our fellow officers continue to not take this seriously. A properly maintained and lubricated firearm following the manufacturer’s guidelines is as important to you and those that rely on you as understanding sound tactics and techniques to survive a firefight on the street. 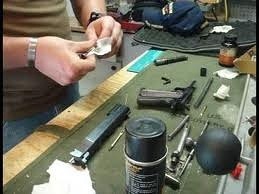 Every time a firearm is taken apart, cleaned, lubricated, and put back together, you should perform a function check. Often at the beginning of a training class I will have the students unload, make the weapon safe and perform a function check. I am often surprised by the number of officers that have been “trained” and carrying the firearm for some time that still do not know how to properly perform a function check on their side arm or a shoulder mounted weapon they may be using. While specific firearms require specific manipulation for a weapon-specific function check, general guidelines for a function check will be covered in a later article. So, let’s move on to some more terms such as slide forward, slide to the rear, primary stoppage, secondary stoppage, etc. Slide (or bolt on a semi-automatic rifle or shotgun) forward means that the slide or bolt is all the way forward in the normal locked (firing) position but the weapon did not go BANG! Slide (or bolt) to the rear means that the slide is locked to the rearward position. 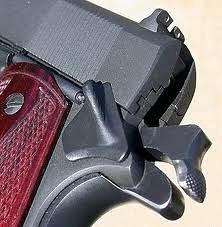 Primary stoppage means that when you pressed the trigger you heard or felt a hammer / striker fall. Secondary stoppage means that when you pressed he trigger you did not hear or feel a hammer / striker fall. First, if you have to press the trigger and the weapon doesn’t go “BANG!”, your first immediate action is to MOVE!, preferably toward cover, but if none is available, remember that a moving target is harder to hit than a stationary one. (2) no hammer or striker fall, chances are that the weapon is empty and needs to be reloaded. The fix is to reload the weapon and get back into the fight! Sounds simple enough, but how many times have you seen in training shooters; (a) catch an empty magazine, (b) place an empty magazine in a pocket, etc.? If you need to continue shooting, the most important thing is to get the fresh magazine into the weapon and chamber a round. The empty magazine is worthless! Also, some shooters practice the method of pointing the muzzle of the semiautomatic pistol straight up and flipping it in their hand so the magazine well points out at a ninety degree angle. The theory is that you can see the opening of the magazine well out of your peripheral vision or “combat window” and are less likely to fumble a reload. 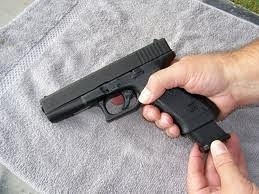 I can’t say that I’m a big fan of this technique, as pointing the muzzle straight up on a semiautomatic pistol with the slide locked to the rear tells the whole world (including, possibly, your assailant(s)) that YOU’RE EMPTY. I’ve also seen shooters that get the steps wrong and flip the pistol to the ninety degree angle before pressing the magazine release, and then wonder why the magazine doesn’t fall out. (Sir Isaac Newton figured this out a few centuries ago.) I prefer to keep the muzzle pointed at the threat / threat area with the magazine well pointed down while executing the reload. All of this should happen as you are moving and the weapon is still up, pointed toward to threat or threat area. 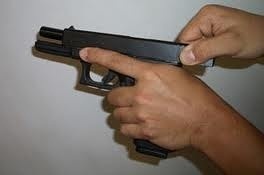 With a semi-automatic pistol, a good “par time” for a tap, rack, ready is about 1.0 – 1.5 seconds. With a semiautomatic rifle, about 1.5 seconds. Dipping the muzzle toward the ground and staring at the weapon does nothing except alert your assailant(s) that you are out of the fight. (3) When you press the magazine release, the magazine does not fall out of the weapon, you may have a failure to extract combined with a failure to feed, also known as a “double feed”. We refer to it as a “secondary stoppage”. That’s a lot of moving parts to memorize, and under low stress on the range we’ve seen a lot of shooters get the steps out of order, making the stoppage even worse. magazine may have caused the stoppage in the first place. That being said, practice your stoppage drills. 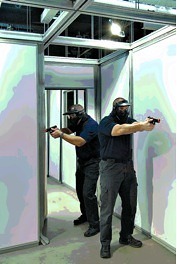 You can do them in any safe area that allows movement and has simulated cover. Make certain to remove all live rounds from the area and use only inert training cartridges. Did you know that we are an international company? For years we have been increasing our presence abroad. Countries around the world have been increasing their police and military forces to parallel their growing populations. With more officers and law enforcement staff, countries are turning to Action Target to provide the very best training solutions. With our diverse line of range-related products, we have been fortunate enough to be selected to build some of the largest shooting facilities in the world. We have designed, manufactured and installed indoor, outdoor and M.A.T.C.H. (Modular Armored Tactical Combat House) ranges for our international friends and US military bases located on foreign soil. 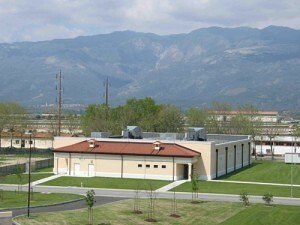 Pictured above are structures we built in Germany that utilize M.A.T.C.H. technology. They are just one example of the course and scope of our international efforts. Along with our range and steel target technology, we have been sought for practical application training solutions as well. Action Target has been able to supply some of the best military and law enforcement trainers from the US to provide a comprehensive training program using our range equipment. Our ability to provide training on the equipment we manufacture and install continues to set us apart. We can provide this service with the purchase of our systems for a limited or extended time. If you do not have a range and/or would like to discuss having some specific coursework delivered to your personnel, we would like to discuss the options available with you. We have the capacity to deliver the entire spectrum of shooting-related coursework. Our capabilities including classroom and nomenclature discussions to static live fire, non-live-fire, force on force, close quarter combat, tactical live fire all the way to the pinnacle of tactical combat house live-fire training. Basically, if you have a firearm-related training need, whether it is for equipment, instruction or both, Action Target has a solution. If you would like to know more, please contact the Action Target representative for your area. Their information is below. If you are with the US Military and want to discuss range options in the US or abroad, please contact the military representative for your area. Their information is below. Whether you are looking for targets, targeting systems, range development, training or anything else, please let us know. Our international staff will be able to find a solution to your needs. Since we are always committed to service and producing the highest quality products, please provide any feedback you may have by clicking here. (Continued from last week…)There are inherent legal problems training with non-carry ammunition. The weight of non-lead bullets, are on average 25% less than that of standard lead projectiles by caliber and therefore accuracy is reduced at the firearms effective distances (long distances). Pistol harmonics and point of aim, likewise, change and occur at the shorter distance. So if a different practice round is trained with, the arguments can always be raised that it is different than the carry ammunition and the legal argument is created. Military doctrine has always required engaging the enemy with mass firepower at the maximum effective distance of the firearm (whoever puts the most steel down range wins). Police trainers’ doctrine should also do the same. But, even if you are practicing and not hitting to the same point of aim with the duty and practice ammo, the lighter, non-lead practice ammo won’t do. Training with firearms requires developing proficiency at the weapons tactical or practical longest distances. That must be learned first. 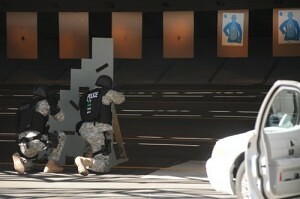 Close in rapid tactical drills come in second. 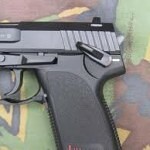 However, if perceived recoil is different between a 100-grain and 140-grain bullet, a legal argument is again created. Non-lead practice ammunition has no military value for combat. Lead again is and remains because of its weight and position in the periodic table, the main component for small arms projectiles of choice. In our [Clark Vargas & Associates] opinion, LEO’s need to practice and qualify with what the less expensive issue ammunition or be subject to lawsuit, especially after a “bad” shooting incident. From a cost stand point, why shoot more expensive copper frangible and then have to qualify with lead on the same range when what you end up doing is contaminating the existing copper dust deposits with lead and then you can’t recycle any of it? The big break in ammunition technology, with respect to LEO training and environmental concerns, has only been the development of the lead heavy metal free reliable primers. Air sampling conducted at live shoots, with various totally encapsulated projectiles and lead free primer products is reported to have consistently proven to totally eliminate breathable lead exposure at the firing line. The problem with the acceptance of the non-lead primed ammunition for tactical use has been that the non-lead primers are less sensitive than those with lead styphnate primer and increases the chance of misfires occurring, due to no ignition. This problem is being worked on. We certainly do not want misfires happening in a shoot out. Another problem is that non-lead primers were and are hydroscopic and may not store well. Blount, Remington and Winchester as well as others, continue development with new ways of manufacturing propellant charges with non-metallic and non-lead bullets. Blount, CCI Blazer’s appear to be setting the standards in this area of technology with their more reliable lead-free primers. Lead free primers have little effect on velocity and points of aim, thus maintaining weight and velocity consistent to that of standard lead primed current carry ammunition. If a department is unwilling or unable to implement the lead management practices that we have known of for 12 years now, then perhaps they should use non-lead “green ammunition”. It should be realized though that the use of green ammunition is only one of the many alternative Best Management Practices for shooting ranges. It is not, however, the panacea and their use will have unintended consequences. The problems with non-lead alternative projectiles go far beyond the cost of the round. There are the ballistic performance shortcomings as previously discussed and yet unknown health and environmental risks. We know the risks for lead and know how to handle them. A fine point, but points to be considered by the industry are non-lead ammunition. It is available to the military and law enforcement but is illegal for the public to purchase or possess. Frangible copper ammunition is not designed for hunting and if used, a brush buster shot or a bad hit would result in only wounding and animal cruelty. Non-lead ammunition is not accurate enough for competitive target shooting. We now believe that zinc ammunition will be removed from the market place shortly so we won’t discuss that further. However, the Army’s tungsten “green bullet” a more recent debacle is a perfect example of the unknown risks of proposed “wondermetals”. On paper the tungsten metal compound proposed for the Army’s “green bullet” program looked great and development went forward. When real-world fate and transport studies were done, it turned out that the tungsten compound created unintended consequences worse than lead. Soil pH dropped as much as 5 full points, resulting in negative impacts on vegetation and organisms in the environment, as well as having 100% cancer rates in test rats. Can you imagine what could have happened if implemented for existing military ranges? The use of the Army’s “green bullets” on an existing lead range would have decreased soil pH and INCREASED lead mobility in large sites. Clearly not the intended result! 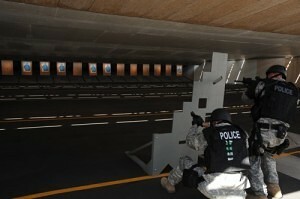 The Federal Law Enforcement Training Center, FLETC, has committed to 16 million rounds per year and is “the driving force behind the development of lead alternative ammunition”, but FLETC also has also acknowledged that lead alternative ammunition technology is NOT acceptable for duty use; they express a desire and opinion that it will be someday. FLETC developed their lead abatement strategy because of citations by EPA prior to the EPA’s development of lead Best Management Practices (BMP’s) and an EPA action due to FLETC’s past problems managing lead. We have come through the zinc experiments and now in light of the Army’s green bullet test results, if, any assertion that non-lead ammunition is comparable to lead ammunition remarks is just plain wrong. Balancing firearms training requirements vs. environmental stewardship is the balancing process the range design engineer and owner have to achieve. Completely eliminating an environmental risk is not possible. Minimizing risk certainly is. Instituting Range Operational Rules only proper ammunition used, wash hands, etc. Eliminating lead dust generation at the bullet trap by proper choice of traps. Utilizing the above BMP’s will eliminate 100% of the lead health safety problem in the range, due to projectiles. Clark Vargas is a professional engineer and President of a successful 23-year-old civil/environmental engineering firm and has designed more than 30 shooting ranges in Florida, New York, Virginia, Tennessee and Kansas. If you are interested in talking to a Territory Representative about your existing range or to discuss designing/building one, please click here. 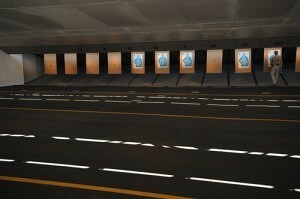 The significant source of particulate lead in an indoor range is the ammunition used. 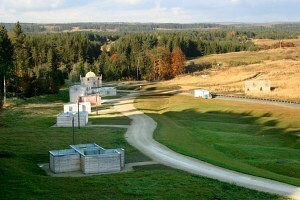 There are four ways lead is generated in the shooting range. The first and worst, also because of particle size, is the primer that starts the powder ignition. It contains the chemical lead styphnate and other heavy metals that insure a proper and reliable ignition. The second, and second worst, because of particle size, is the lead burn of the lead bullet tail of jacketed ammunition. The hot propelling gases result in atomization of molecular lead possibly the most dangerous because of great gas volumes if in haled because of range eddy currents. 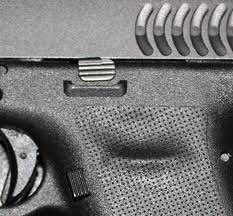 The third is the lead particles spiting out of revolvers and barrel friction on all firearms. It results in varying size lead particles downrange of the firing line on the floor. The lead will be picked up by shoes and tracked elsewhere, where they may or may not be ingested. The fourth method, and the one that generates up to 95% of the particulate lead, is the lead bullet collision with the so commonly used, “hard” 30° to 45° incline steel traps. It is just not prudent any longer to simply design hard steel bullet traps unless “tracer ammunition” is going to be used for machine gun training. Just by changing the projectile to totally encapsulated copper jacketed projectiles, it produces a 97% reduction in lead particulate when compared to using solid lead bullets. The use then of both lead-free primers and totally encapsulated projectiles results in airborne lead being totally, eliminated at the firing lines and breathing zone. Military and law enforcement are the high consumers of ammunition and will still continue to utilizes jacketed bullets with lead primers for some time to come. The many calibers of ammunition used and trained with are, the 9mm, .38, .357, .45 calibers, 5.56mm and 7.62x51mm. 12ga slugs and double ought buck. Ammunition comes from a variety of manufacturers. Although lead-primed, jacketed ammunition is the standard, it won’t be long before reliable non-lead primers become the new standard, along with totally encapsulated lead projectiles. Hard bullet traps are the major reason, as much as 95% of for the unintended generation, of lead in dust and waste streams in firing ranges. Most existing bullet traps terminate the bullets energy with a metal to metal hard collision generating heat, lead slatter and fragments and dust. Softer termination schemes such as the 12° to 17° dry or wet funnel type traps with deceleration chamber and/or swirl chamber or snails are much gentler and produce no dust. There are three antiquated metal bullet traps most common and still in use today; the escalator type, the venetian blind type and a “pit and plate” type. Each of these type backstops has advantages and disadvantages, however the net results remain the same: hard impacting lead projectiles on hard steel, causes extreme fragmentation of the lead and production of lead dust. Gene Fabian reported in 1996 that a full 20% of the lead bullet weight shot downrange on hard steel backstops do not end up as large enough lead pieces that can be recycled. A full 20% of the lead turns to small fragments, powder and molecular lead not captured in the trap. It ends up as settled dust or in the bag house. Downrange contamination becomes the major reason that hazardous conditions have resulted in firing ranges. Unless, these steel bullet traps are frequently maintained and HEPA vacuumed, lead dust accumulates to the point that it becomes stirred each time the ventilation system is used. It has been observed that human overexposure in such cases can occur even in the absence of shooting. The major improvement over the antiquated steel traps discussed above are the soft traps of 30° and less angle plate dry or wet funnel type bullet traps. The collision is a lot softer on projectiles since bullets impact the plates at a 12 to 17 degrees or less incline and slide into a swirl or deceleration chamber. Any dust that is produced can purportedly be vacuumed by an exhaust fan and directed to a filter chamber or washed into a water oil mixture. Two problems can occur with the dry-funnel design. The first is, the shooting range is designed as a negative pressure room that can easily overcome the bullet traps aspiration fan capacity and may result in lead dust settling in the range room anyway. The second problem that occurs is that over the life of the trap, lead smearing will occur even with jacketed and hollow point ammunition. When the range is finally closed, all the steel will have to be disposed of as hazardous waste or cleaned. Because of the concern for lead dust generation at steel bullet traps, the bullet trap manufacturers have made efforts to do research and develop new traps. 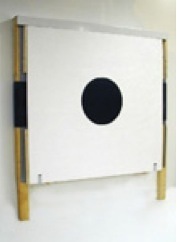 In 1989, Ron Coburn designed a funnel trap utilizing water and oil film on the impact plates to totally eliminate the dust generation from the projectiles impact on the steel impact plates. Although very effective in reducing downrange contamination, it is believed to increase long-term maintenance cost. Cost, due to the creation and the recovery and disposal of a hazardous water oil waste, increase in humidity and clogging of the recirculating system with paper bits. That has made it difficult for designers to fully accept this method as being the answer to bullet traps. However, it has promise aesthetically. Increased (oil/water) humidity in the range, we are told by users, makes the range seem slippery and paper pieces in the water that make it a past the screens stops flow and burns out the pumps. Probably the closest to desirable to date of the soft traps that works best are the low volume shooting chopped rubber traps. These bullet traps capture projectiles intact and allow for full recovery without generating a mixed waste stream. The bullet trap is constructed on a concrete sloped floor or preferably with a steel support frame and a soft rubber sheet front, which allows all bullets to penetrate intact 4 to 6 inches into the matrix. The space created between the steel and rubber sheet is filled with pieces of recycled rubber tire sidewalls. Bullets pierce the front rubber sheet and then the square rubber pieces stop the bullet intact through friction by about 6” deep from the surface. The bullets and the rubber pieces are periodically extracted from the bottom through a slide gate fully intact, ready for recycling. The trap must be recycled monthly to preclude the hard armorizing packing of the rubber surfaced with lead. Once every 18 months or so, the rubber must be shoveled out and a complete sifting must be done. These traps can also catch fire so a fire retardant is added to eliminate that condition. If these traps, which are labor intensive, are not maintained they wouldn’t work as intended. Tests performed on soft rubber traps reveal that there are no lead emissions generated at the trap; furthermore, the rubber pieces do not exhibit a hazardous characteristic for lead under the RCRA TCLP definition. The rubber material can be reused for the life of the trap and not result as a hazardous waste upon closure. The choice of bullet trap also very much affects the ventilation design and cost. Rubber traps require two (2) stage filtration and steel backstops require three (3) stage filtration. Both require HEPA filtration as the last filter. LEO’s need to train with their carry ammunition. In my opinion, round nose totally encapsulated ammunition introduced in the 1960’s or jacketed hollow point with no lead primers fit that bill, both at economic prices. They are fully equivalent, ballistically to any of the duty ammo. That is what I recommend in my designs. Ammunition manufacturers have taken the initiative but perhaps sometimes in the wrong direction, at the behest of the Federal Government over the last 12 years, to research lead-free bullets and lead-free primers. “Green ammunition” is the result. “Lead free bullets”, the “Green Ammunition” are the politically correct, all encompassing terminology applied that does not offer much definitive information on how to solve the problem. Green ammunition includes zinc ammunition, frangible copper ammunition, solid copper ammunition, soft nose zinc ammunition, jacketed wound zinc ammunition and jacketed tungsten ammunition, etc. Each provides alternatives for trap and ventilation design but does not eliminate the recycle problem and each has unintended consequences. Bullets manufactured out of non-lead ingredients appear to pose less of a risk to humans, when the ammunition also incorporates lead free primers, but pose equal or greater risk to the environment than the lead munitions. None of the metals used for “green ammunition”, when out of place, are environmentally benign. For example sintered copper bullets the one “green bullet” out of the bunch, which still seems viable turns to fine powder upon impact with the trap or steel target. The fine copper now has to be collected and recycled in its entirety or environmental problems will result. Copper acts is a fungicide and is detrimental to marine organism larvae. When zinc projectiles are used and are shot into existing lead deposits, the value of the lead deposit goes to zero since that deposit can no longer then be recycled. It must now be disposed of as hazardous waste. We also understand that shortly wound zinc projectiles will no longer be manufactured. How many recyclable lead deposits on ranges have been ruined and are now hazardous waste, because zinc bullets were used? Clark Vargas is a professional engineer and President of a successful 23-year-old civil/environmental engineering firm and has designed more than 30 shooting ranges in Florida, New York, Virginia, Tennessee and Kansas. He also is President of the Florida Sport Shooting Association, the NRA’s official state association. He shoots conventional and international pistol competitively and has been invited to shoot for the U.S. Pistol Team try-outs. Mr. Vargas is Past President of the Gateway Rifle and Pistol Club, a 2,200-family member shooting club in Jacksonville, Florida, an endowment member of the NRA, and the NRA’s 1999 Achievement in Range Development Marlin R. Scarborough Award recipient. Just a little over a year ago, we started seeing orders to our online store with comments related to a YouTube video about our steel targets. Such comments included, “I saw your target on the Nutnfancy Channel and I had to have one,” and, “You [PT Practice Stand] received a great review from Nutnfancy.” Since nobody here at Action Target had placed a video on YouTube, we investigated to find out who Nutnfancy was and what was being said about our target. The Nutnfancy Project (TNP) was what we discovered. The first video about our was a huge success. So, we thought it would be a great idea to invite TNP to our main office and manufacturing facility in Provo, Utah to show his viewers where and how the PT Practice Stand is cut, fabricated, packaged, inventoried and shipped. It was our pleasure to host TNP and the result of that visit was a 36 minute video and narrated tour of the entire production plant, which was also posted on YouTube. His video gives all viewers a great background on Action Target and reveals the inner workings of our manufacturing facility. “Welcome to The Nutnfancy Project or TNP. I am an INDEPENDENT reviewer of “dangerous things” like knives, guns, tac gear, and other stuff I dig. I also review a variety of outdoor equipment. My focus is on high quality stuff that I like, that lasts, and delivers exceptional service for the price paid. I believe all gear should be systems based, integrating into a “Philosophy of Use” (POU) that has been planned by the user. I have provided several foundational videos that discuss these POUs with the gear. My primary charter at TNP is a consumer advocate for my valued subscribers and I steer them towards the good deals and good dealers. As TNP continues to grow, this commitment will not change… only the ways I can best achieve it. “My reviews are based on my own varied experiences but admittedly I am not the end-all expert. My reviews are based in logic and experience but also my own preferences. This provides a rudder to TNP as I steer us through the maze of many gear options. I may miss stuff here and there but hopefully my vids show the well-reasoned logic and experience that form their foundation. I never rest with my own “systems” either; always striving for perfection when technology provides advancements. Also I’m always learning from my subscribers who are smart in their own gear applications. “Each video represents my views at the time it was made. I am always striving to improve the accuracy, entertainment value, fun level, and quality of my videos. “Gear reviews are the basis of TNP. But along they way I show many outdoors adventures with the TNP Crew. I encourage defense of good people, our freedoms, making good memories with family and friends, investing your time wisely, and being responsible. “MY INTENDED AUDIENCE FOR TNP: Targeted towards Law Enforcement and Military, my reviews are also intended for responsible civilians too and I fully support the concept of an armed, free people. I also acknowledge and thank my audiences around the world that sadly do not enjoy our freedoms in the US. “WHO IS NUTNFANCY? : US Military, 19 yrs and counting. I keep these associations and the specifics vague for MANY valid reasons (death threats). But they are real and not made up as people have discovered. “THE NUTNFANCY MISSION: To have fun and to help good people around the world learn about quality gear and not get ripped off. I enjoy helping cops, pilots, soldiers, and good citizens everywhere navigate the bewildering array of offerings and disinformation about it all. I will help you zone in on the good stuff and the good suppliers. I also like to encourage responsible and wise use of these items in the defense of good people. I encourage political activity to preserve our freedoms. I’m not trying to be better than anyone else, act like my opinion is the best, be a poser, be Superman, save the world, invent the cure for cancer, or act like the expert of experts. I’m just doing my thing, sharing my takes, having fun, and keeping it real. My promise to my subscribers is to keep my critiques real, honest, and as accurate despite the hater, hyena, and brand myopic flak. “THE ITEMS: The majority of items reviewed are NOT mine as I have several professional and retail sources for them. “DEATH THREATS: Yep these exist against me and my family (graphic ones)…punishment for TNP’s success I guess. I remain focused on the positive message of TNP and remain focused on serving my subscribers with cool adventures, quality information, and realness. I thank my TNPrs for the support against these unfounded criticisms and possessed critics that let Verilioness and myself move TNP forward! “REVIEW REQUESTS: I get thousands of these but will only be able to do some of them. Some items are just hard to get and others I just don’t care for and it would just be a negative review. Also this is just a hobby for me (can you believe it?!) and as such I try to keep it fun..
“RESPONDING TO COMMENTS AND PMs: The demands of my real jobs and keeping the TNP going often prevent my replies to your messages. Most of my edited videos take 1 to 3 days to create. I do this in between my military, other job, friend, and family commitments. Moreover I am constantly engaged in my own gear projects which I usually share with you in video form. Yes I’m maxed out but I have a strong work ethic and will continue to produce hundreds of more videos full of adventure, fun, good times, and useful information. But answering the PMs sadly takes a backseat to this production priority. I strive now to answer more Channel Page Comments so others may benefit from the discussion. I will give video updates on the Project every quarter! “THE FUTURE: I have several imitators on YouTube that use my exact reviewing style, gear mix, and verbiage as they try to duplicate TNP on their own YT Channel. That is flattering but I doubt anyone will ever duplicate the breadth, personality, and heart of TNP. Also TNP will grow bigger as time goes on and I will use that clout for you to get good gear at good prices. I am humbled by the popularity of TNP but it will never go to my head. I remained focused on the TNP mission of realness in gear assessments, fun, the preservation of liberty, and promoting and protecting the good things in life. “YOUR SUPPORT: BIG THANKS for clicking on my advertisers which support the TNP. I thank them too for supporting us! That revenue goes to gear acquisition for reviews and helps preserve my independence. Thanks for your nice comments, the good ratings, slapping down the dummies for their stupid and sometimes hateful comments, and especially the subscriptions as this feedback encourages me to make more. “FREEDOM: Patriots belong in the NRA. Please join and keep membership current. For Nutnfancy’s Practice Target video, click here. For Nutnfancy’s video of his visit to Action Target, click here. New Partnership with Hufcor, Inc.
As an industry leader in providing affordable, effective and relative training solutions, we have partnered with Hufcor, Inc. to offer their FlexTact movable wall training system with our other line of products. This system is currently for non-live fire training. Since non-live fire training can really be conducted anywhere, what is so great about this system? It’s simple. The system can be completely be reconfigured within minutes. For example, in a matter of a few minutes, you can transform your office scenario to a warehouse then into a residential setting. If you need to serve a high risk warrant and want to realistically structure your breach training, the physical layout of the residence can be duplicated with the FlexTact system. Hufcor, Inc. and Action Target have entered into an exclusive sales agent agreement to represent the FlexTact® moveable wall systems to markets throughout the world. FlexTact® training systems are only available from Action Target to the commercial, military and law enforcement communities. The FlexTact system compliments our core expertise in live fire ranges and shoot houses such as the Modular Armored Tactical Combat House (M.A.T.C.H.) live fire structure. “Our strength is our 25 year experience within the law enforcement and military firing range and shooter supply markets and the various sales channels that are present within these markets. We are not operable partition experts by any means. 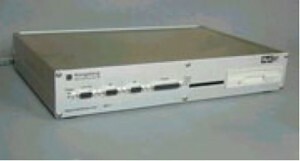 We understand the intricacies of our niche, not on how to install tracks and panel systems. By combining our companies’ reputations we truly have an unstoppable combination for selling reconfigurable simunitions shoot houses,” said Jerrod Kermath, with Action Target’s Office of Market Development. For additional information on FlexTact, please visit our shoothouse page or contact your area’s Territory Manager by clicking here.